Nina Birnbaum and her daughter, Yael. Like many businesses, Softress got its start with a frustrated mom. 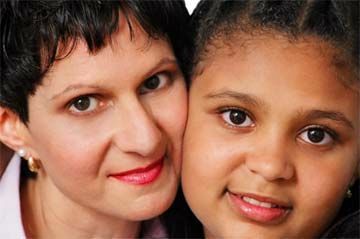 Nina Birnbaum was having a tough time finding a product to detangle and condition the hair of her multi-ethnic daughter, Yael. 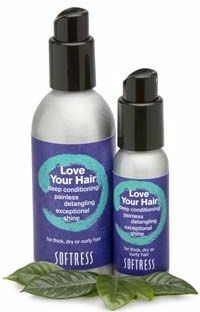 "Finding products for her fine, dry, curly hair was a nightmare," recalls Birnbaum, founder of Softress natural products. "I couldn't find a conditioner that worked. Regular conditioners dried her hair, while ‘ethnic’ products were too heavy." In her quest to find viable solutions, she began researching natural oils and creating her own formulas. Four years ago, she developed an all-purpose skin and hair oil and a shea butter cream, and began testing them on her friends and family. Birnbaum took it to a few holiday fairs, and they sold well. She realized she had the makings of a business on her hands. She added Vitamin C and Vitamin E to stabilize the oils and nourish the skin and hair. The light, permeating products were effective and "so pure they're actually edible," Birnbaum says. Softress now includes five all-natural blends for the hair and skin, including a baby oil and two formulas for eczema. And she’s finally solved the problem of her daughter’s hair. Love Your Hair is ablend of nourishing oils that deep condition, detangle and add shine. It can be used on wet or dry hair without building up, as a leave-in, a rinse-out, or a hot-oil treatment, and it works for most hair types. Bringing Softress to market has been a slow process. She had a friend build her a web site, and began sending out samples for companies to try, including NaturallyCurly. But the products weren't ready yet for the mass market. "It amazes me how versatile the product is," Nina says. "Parents tell me it's the best detangler they've ever used. Athough I made it for Yael's multi-ethnic hair, her dad, who is African-American and wears locks, says it’s great for moisturizing his scalp. A few drops condition my wavy hair beautifully. And it has a dramatic effect on frizzy, overprocessed hair. Even I’m surprised by how healthy and smooth really damaged hair can look after the first application. Dyeing and perms can destroy hair’s texture. Love Your Hair puts the life back in." Nina says Love Your Hair "plays nice" with all kinds of styling gels and mousses. She notes that under gel, it keeps hair soft while providing curl definition. With her products ready to go, Birnbaum says she was ready to launch Softress in 2006 when, at 48, she was diagnosed with breast cancer. Fortunately, it was caught early and hadn't spread. "I had no idea what to do after I got that awful diagnosis" Birnbaum says. "I was overwhelmed by the amount of information available online, but I couldn't find a simple guide to what my next steps should be. I thought I could use the web site to help other women find good information. With the help of her breast surgeon, Nina wrote a breast cancer resources page for her web site. She plans to write an eczema resources page next, with the knowledge she’s gained over 10 years of researching her daughter’s condition. As the company grows Nina looks forward to supporting the organizations in her breast cancer resource guide.